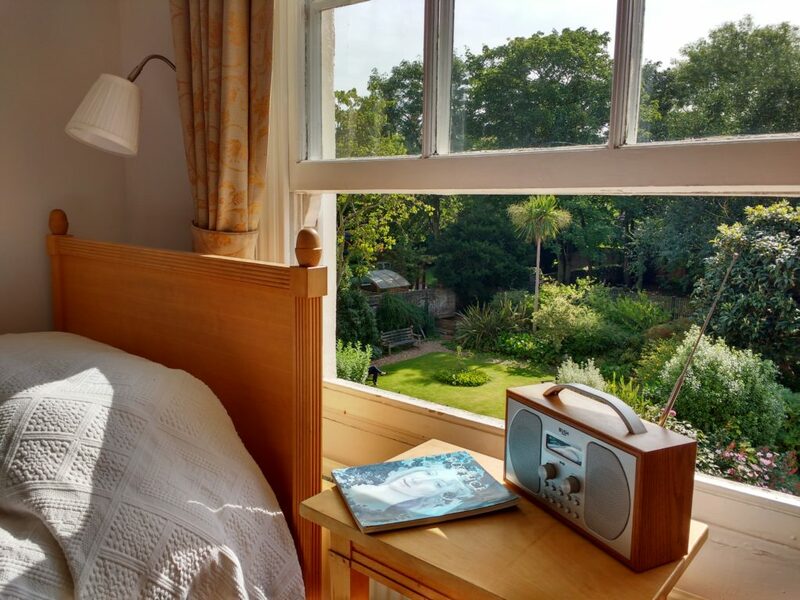 Each one with its own character, our four single rooms that are located on first floor of the building, have a splendid view over the garden. With windows facing south east the sun will greet good morning with its beams. Our standard single rooms are named after some of the greatest artists in art history. Each had their own unique style; Leonardo da Vinci, the High-renaissance master that painted in precise details and depth and John Constable, the English romantic that painted atmospheric and memorable landscape pictures. We also have the early-renaissance painter Botticelli, known for his iconic soft figural style and last but not least the genius and post-impressionist, Vincent van Gogh. Two of our standard single rooms come with private shower facilities but toilets are shared. Bathrooms and shower-room are located on the corridor and kept immaculately clean. Our special small single room is located on the west side of the building and named after August Macke, a remarkably accomplished and influential painter despite his short life. The room is small and comfortable and overlooking the courtyard. The room has shared bathroom that are located just around the corridor. Accessibility: Because of the historical nature of the building it is not possible to install lifts and so the bedrooms, which are all on the first and second floors are not accessible with a wheelchair. Please note: We have a policy of not accommodation children under age of 12. This policy is only in place as the rooms in our historically listed building are acoustically sensitive to loud noise. Bed and breakfast guests can enjoy their morning tea or coffee and the hearty affair from the breakfast buffet in a relaxed and warming atmosphere. 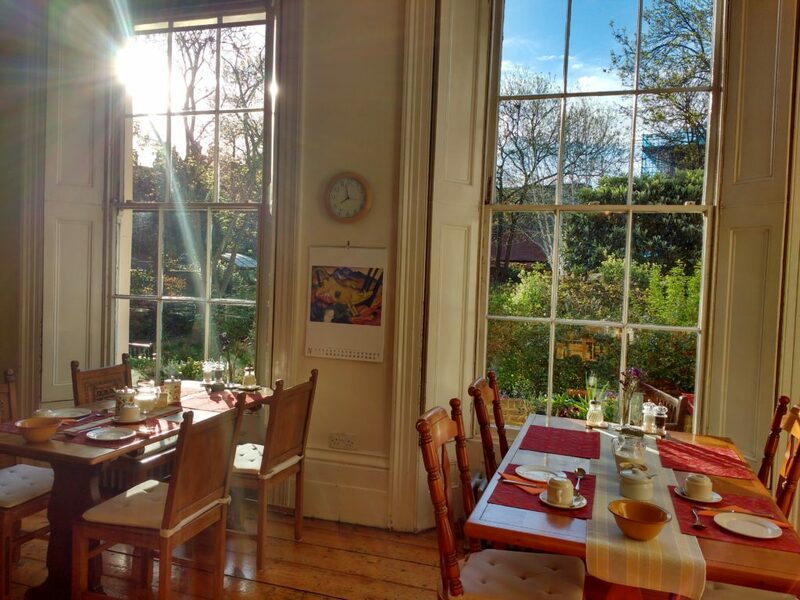 In the breakfast room, there are three large antique windows looking out to the garden, bringing brightness and sunshine into the room and peace to the mind. The ever changing garden throughout the seasons hides many treasures. Its special romantic character expresses itself in its imperfect glory. Flowers, roses, palm tree, silver birches and all kind of wilderness grow in harmony and bees, squirrels, birds and curious cats are frequent visitors in the garden, enjoying the peace just like our bed and breakfast guests. The garden has been very generous to us. In autumn apples fall off the apple tree and its delicious apples are served for breakfast. Over the summer the seasonal flowers are used for decoration inside the house. Check in times are from 2.00 pm – 9.00 pm. The check out time is by 10:30 am. We need guests to have left the rooms by 10:30 but club members of Temple Lodge are welcome to rest longer at the open spaces of the house premises until departure. You are also welcome to use our Beautiful Garden and Library. We are happy to keep your luggage on the day of departure after you have checked out.